You break it, he fixes it! This week’s not-so Wordless Wednesday comes from our holiday fun! Bubby wanted his own tools, just like Daddy. 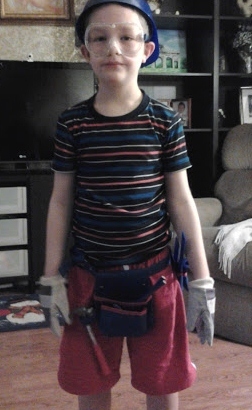 This year, Santa brought him a set that came complete with a hard hat, suspenders, gloves, and a tool belt. He loves his real tools, and he loves dressing up and pretending to be Mr. Fix It along with his assistant, Sissy Girl. What fun things have your kids done this week?